در این مطالعه بخش‌های زیرین سازند گورپی در یال جنوب ‌باختری تاقدیس کوه گورپی از دید نانوفسیل‌های آهکی بررسی شد. 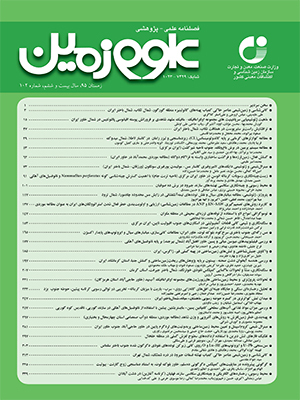 بر پایه گونه‌های شاخص نانوفسیلی، زیست‌زون‌های CC22/UC15eTP تا CC24/UC18 در محدوده مورد مطالعه تشخیص و سن کامپانین پسین- ابتدای مایستریشتین برای این محدوده در نظر گرفته شد. تجمع نانوفسیل‌های آهکی موجود بیانگر حضور همزمان گونه‌های شاخص میزان بالا و پایین مواد غذایی در برش تحت بررسی است. فراوانی جنس و گونه‌های الیگوتروف (Eiffellithus spp.، Prediscosphaera spp.، Watznaueria barnesae، Watznaueria fossacincta، Lithraphidites carniolensis، Staurolithites spp.، Micula staurophora و Cribrosphaerella ehrenbergii) بیش از گونه‌های یوتروف (Biscutum constans، Discorhabdus ignotus، Placozygus spiralis، Reinhardtites spp.، Zeugrhabdotus spp. و Tranolithus orionatus) بوده و در کل روند فراوانی گونه‌های الیگوتروف به سوی بخش‌های بالایی برش (مرز کامپانین- مایستریشتین و مایستریشتین پیشین) افزایشی و روند فراوانی گونه‌های یوتروف کاهشی است. Calcareous nannofossils have been investigated at the lower part of the Gurpi Formation at the southwest of Gurpi anticline. According to the index calcareous nannofossils CC22/UC15eTP to CC24/UC18 bio-zones have been identified and the age of Late Campanian ‒ Early Maastrichtian is considered for the studied interval. Statistical analysis of the assemblages indicate the presence of high and low nutrient taxa. The relative abundance of oligotrophic taxa (Watznaueria barnesae, Watznaueria fossacincta, Prediscosphaera spp., Eiffellithus spp., Lithraphidites carniolensis, Staurolithites spp., Micula staurophora, Cribrosphaerella ehrenbergii) is higher than eutrophic forms (Biscutum constans, Discorhabdus ignotus, Placozygus spiralis, Reinhardtites spp., Zeugrhabdotus spp., Tranolithus orionatus), and an increasing trend in the relative abundance of oligotrophic taxa along with a decreasing trend in the relative abundance of eutrophic forms can be observed towards the upper parts of the section (Campanian-Maastrichtian boundary and Early Maastrichtian).